A Soviet RRAB-3 "Molotov bread basket" (left) from which bombs were spread. The RRAB-3 (Russian: ротативно-рассеивающая авиационная бомба, "rotationally dispersing aviation bomb"), nicknamed the Molotov bread basket (Finnish: Molotovin leipäkori), was a Soviet-made droppable bomb dispenser that combined a large high-explosive charge with a cluster of incendiary bombs. It was used against the cities of Finland during the Winter War of 1939–1940. The bomb consisted of a cylinder 2.25 metres (7.4 ft) long and 0.9 metres (3.0 ft) in diameter. As it fell from an aircraft, a small turbine on the nose turned to release a spring loaded casing which, on opening, scattered 100 or more incendiary bombs; the main HE charge in the tail of the weapon continued to fall as a conventional bomb. Other descriptions make no mention of a main charge and instead describe a large cylinder with vanes at the back that open out when the weapon is dropped. The vanes cause the bomb to spin and this has the effect of opening the sides and scattering the submunitions by centrifugal force. In 1939, the Soviet Foreign Minister, Vyacheslav Molotov, claimed the Soviet Union was not dropping bombs on Finland, but merely airlifting food to starving Finns. 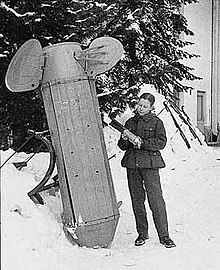 The Finns were not starving, and they dubbed the RRAB-3 cluster bomb "Molotov's bread basket." They also named the improvised incendiary device that they used to counter Soviet tanks, commonly known as the Molotov cocktail, "a drink to go with the food." This description seems to have become common currency among the British public in 1940. During the Bristol Blitz, the locals dubbed a similar German device "Goering's bread basket". The Soviets had several versions: RRAB-1, RRAB-2, RRAB-3, with capacities of 1000, 500, and 250 kg respectively, each capable of holding various types of submunitions including HE, incendiary, and chemical. ^ Langdon Davies, John (June 1940). "The Lessons of Finland". Picture Post. ^ "Big Russian Bomb Holds Sixty Little Ones". Popular Science. July 1940. ^ Olive Mary Barrow. "Molotov Breadbasket in Southwick, West Sussex". WW2 People's War (BBC). Retrieved 14 February 2018. ^ Richard Harris. "A little Lad's War: Bath Blitz, War Effort, Father Preparing Civil Servants for Germany". WW2 People's War (BBC). Retrieved 14 February 2018.